A deed of trust is typically used in real estate. It is used for the transfer of property. A deed of trust is a legal document typically used in real estate to transfer property. The deed may involve the cooperation of three parties, including the borrower, the lender, and the trustee for the property. Personal information about these parties will also be included on the form. This type of deed may be used instead of a mortgage in order to transfer property and initiate financing. It can also be used to complete loans for things other than property. Because a deed of trust deals with monetary aspects, it is important to include as much information as possible about payments and due dates. A deed of trust is a legally binding contract, so it should be accurate and professional. Legal counsel from an experienced law firm can help you set up a deed of trust for your personal transaction to ensure that all parties involved are protected in case of a dispute. In the world of real estate, a deed of trust is a legally-binding form that transfers the legal title for the property to a trustee, or neutral third party. The trustee then holds the deed of trust as security, or as a form of promissory note for the repayment of the loan. The borrower of the money, likely the person currently living in or using the property, maintains an equitable title. This is the right to obtain full ownership of the property, generally by full repayment of the loan. While the borrower’s equitable title gives them current physical usage of the property, the completed deed of trust template means that the trustee will hold full legal ownership of the property until the terms and conditions of the agreement are met. If you use a free deed of trust form online, it’s important to understand what the form does and does not entail. Once the deed of trust template is executed, with the borrower holding the equitable title and the trustee holding the legal title, an escrow holder almost always comes into play. The escrow holder generally keeps all of the documents in one place for the transaction, including any funds, the grand deed and the trust deed. This is to ensure that the title transfer and borrowing process will be completed only if or when both parties complete their respective parts of the deal. When using a free deed of trust form, many people wonder what the actual differences are between a deed of trust and a traditional mortgage. In fact, the deed of trust template is often confused and used interchangeably with the standard home loan process. So what, exactly, is the difference between the two? A deed of trust will always involve three parties – the buyer, the seller and a third, neutral party to ensure completion of the real estate contract. In most mortgages, the lender or mortgagor gives the legal title directly to the mortgagee. In both cases, the title the borrower holds will only be an equitable title until they are able to complete the terms and conditions of the legal agreement. 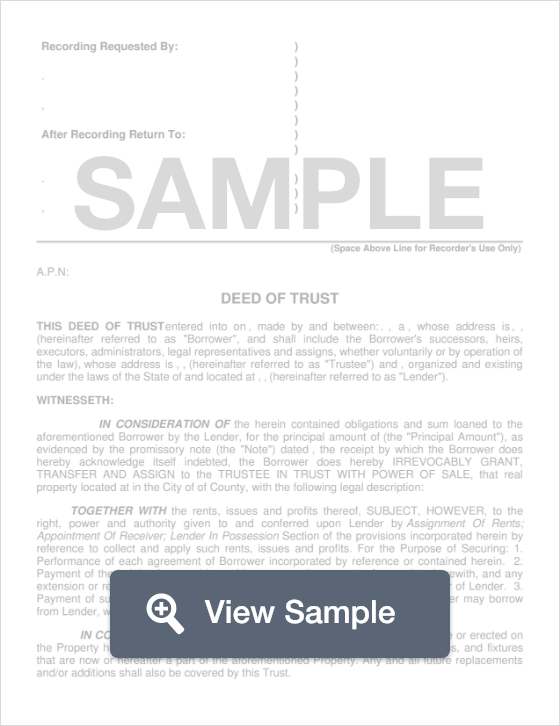 For those conducting their own real estate transactions, a free deed of trust form can be found online, executed and filed with the county recorder or county clerk at the location of the property. Filing with the county clerk or county recorder is important. This filing acts as notice to any interested parties that the property is in the process of being purchased via a deed of trust. Although the deed of trust template can technically be used in most states, it is actually the most common tool for financing real estate in several states. According to state law, California, Colorado, the District of Columbia, Alaska, Arizona, Idaho, Maryland, Mississippi, Montana, Missouri, North Carolina, Nevada, Nebraska, Tennessee, Oregon, Texas, Utah, West Virginia, Washington and Virginia all allow the use of a deed of trust. In these states, deed of trust templates can be used for other types of loans and contracts wherein real estate is used as collateral. 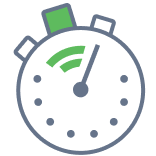 Create a free Deed of Trust in minutes with our professional document builder. Is Donating Property Right For You? While donating property might seem to make little sense, in certain circumstances it may present an attractive financial option for owners looking to contribute to a charitable cause. This guide offers a primer about donating property to a charity. We cover who might consider donating, the dos and don'ts of donating, how to donate, the tax implications of donation, and much more. We believe this guide is a helpful tool you can use to determine whether or not donating property makes sense for you. There are several reasons property owners may wish to donate property. Donating property begins with someone who owns a plot of land or residential or commercial real estate that has appreciated in value that they no longer wish to maintain. If any of the following applies to that property owner, they may choose to donate rather than sell their property. The owner wishes to avoid the associated real estate costs, capital gains taxes, etc., especially if their house is paid in full. The owner believes their property may appeal to a charity they believe in. For example, you may own a plot of land on, or near, a nature conservatory. Note: before you pursue donating real property to a charity, contact the organization and learn more about what the donation process entails, or if they are even interested in the property, etc. Consult with a financial planner, especially if you are donating primarily for tax purposes. A financial planner will ensure you receive the maximum tax benefit. Work with the charity to help ensure proper use of the property after donation. Hire an independent appraiser to assess the property before donation. Employees of the organization receiving the property cannot legally appraise it, per IRS guidelines. Disregard your mortgage/mortgage payments: remember, your equity in the property is the market value minus what you owe on your mortgage. In a bargain sale, the charity purchases the property for less than market value and eliminates the mortgage. Donate impulsively: be sure to consider all of the financial, legal and personal ramifications of donation. Remember, gifts to charity are irrevocable; you will not get your money back. Direct gift: the simplest way to donate real estate. Owners transfer the deed or title over to the chosen charity and relinquish all interest in the property. Charitable remainder trust (CRUT): enables owners to donate property while also preserving some of their financial interests. A CRUT is tax exempt; therefore, if the CRUT decides to sell an asset (e.g. your property) all of the proceeds are available for reinvestment. A CRUT pays out money to beneficiaries each year at a predetermined percentage of the trusts’ appreciation. At the end of a CRUT’s life (i.e. when all beneficiaries are deceased), all remaining assets are donated to pre-designated charities. In return, the seller receives a tax deduction that equals the difference between the fair market value and sale price. There are, however, caps on the deduction amount. Prearranged sale: requires a seller to enter into a binding agreement to sell the property. In this arrangement, the seller legally sells the property to a charity, thereby avoiding capital gains tax. However, if and when the charity sells the property in the future, the original seller is responsible for the previously deferred capital gains taxes. Deprecation: A depreciation functions much like a standard income recapture. If a property you sell depreciates rapidly, You can ask the IRS to reduce your tax deduction by the amount of depreciation. How does tax reform impact charitable giving? The most recent tax bill has several important changes to the tax code that impacts property donation. Those changes include increasing the standard deduction to $12,000 for individuals and $24,000 for married couples filing jointly, $18,000 for head of households. Charitable deductions, moreover, will not reduce income taxes unless the total amount donated exceeds your standard deduction amount, assuming you take it. How does this affect giving? If itemizing deductions, rather than taking the standard deduction, makes sense for you, you can continue to use charitable deductions as you have to this point. Donate appreciated property to charity. If you itemize, you will get double the tax break of a deduction based on the sum of appreciated assets and capital gains avoidance. If you are 70 and a half years old (or older) you may transfer up to $100,000 from your traditional IRA to charity. The new tax law does not limit deductions on estate tax donations, so consider including a gift for charitable donations from your state. Donate to charity as soon as you retire. Your assets in retirement accounts (aka IRA, 401k) may be subject to taxes if you give them to beneficiaries. If you donate to charity, however, you will avoid all income tax. Cost: there are often significant legal fees associated with accepting property donations. Make sure, therefore, that you calculate the associated legal costs and ensure the donation is worth it. Once you accept the property, it is yours to maintain. Make sure you understand all of the resources and costs required to maintain the property. If your charity has limited resources, it may be too burdensome or cost-prohibitive to maintain the “free” property. You may have to pay taxes on income generated from the property that does not directly align with your charity’s mission. For example, if you collect monthly payments from tenants (rent) in a donated property, you must pay income taxes on those rents. As a 501 (c)3, How do you accept a property donation? If a property gift is worth more than $250, the non-profit must provide the donor with a written statement acknowledging the donation and include specific information, required by the IRS, in the statement. If an organization or donor fails to follow specific IRS rules (such as establishing fair market value of the donated property or indicating the value when the deduction is listed on the donor’s tax return) the donor might not be able to deduct, and both the donor and organization can face penalties. With that in mind, here is our step-by-step process for receiving a property donation worth more than $250. This can be a receipt, letter, email, etc. If the charity did provide goods in return for the property, include it in the description and the estimate the value of those goods. Send written statements to the donor before January 31, so the donor can include the donation and statement on their tax returns. This will inform the IRS of the value of the property when at the time of sale which the service will compare to the estimated fair market value provided by the donor. Donating property to a charitable cause will, first and foremost, help an organization you believe in better meet their mission and accomplish their goals. Moreover, in the right situations, it might also be financially prudent. We hope this guide provides you with the information you need to determine if donating your property makes sense for you. Which US States Prioritize Volunteering over Charitable Donations? Numerous reports have found that residents in US states prefer volunteering over charitable donations. Our team at FormSwift was interested in seeing just how much more US residents volunteer than they make charitable donations. We calculated the ratio of percentage of individuals in each state that volunteer to percentage of individuals that make charitable donations annually. From these ratios we created a ranking from 1-50, with 1 representing states that volunteer to the greatest extent more than they donate money. A deed of trust is one of many ways that a real estate can be transferred from one person to another. With a deed of trust, a seller has a piece of real estate they are selling to the buyer. A Trustee, usually with a title company, holds the deed of the property during the time that the loan for the property is being paid off. A contract for deed is a binding legal agreement between a seller and the buyer of the house. A contract for deed is a promise for the buyer to make monthly payments. The buyer retains the deed until the loan on the property is paid off. The purpose of the property deed is for the grantor to give their interest in real estate of some kind to the grantee. It's important to note that each state sets legal guidelines for what needs to be included in a property deed. A quit claim deed is a legal instrument that grants the interest in property that one person has to another person. Your quit claim deed may need to be notarized before it is placed on file with the county recorder's office.